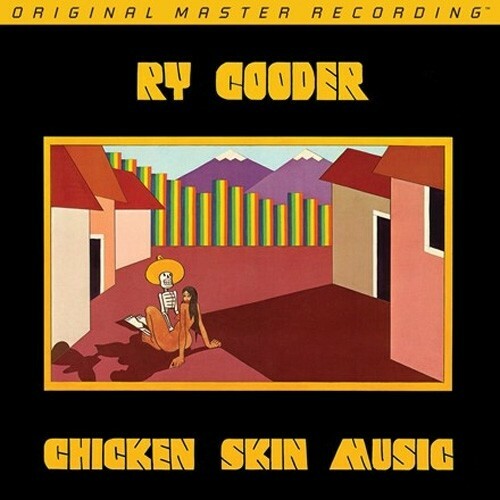 Ry Cooder's fifth album, Chicken Skin Music, was released in 1976. Mastered from the original master tapes and strictly limited to 2000 numbered copies, Mobile Fidelity's hybrid SACD of Chicken Skin Music brings the brilliant instrumental textures and lively tonalities to the fore like no prior digital edition. Graced with silent, black backgrounds and generous soundstages, this reissue particularly underscores the depth of Flaco Jimenez's accordion contributions. You'll hear the air flowing through the reeds, pressure resonating from the bellows, and the wide-spanning timbres emanating from the register stops. Cooder bookends everything with a pair of Leadbelly numbers – "The Bourgeois Blues" and "Goodnight Irene" – chosen after Cooder witnessed Jimenez and his band perform at a local dance. Given their ordering on the album, techniques they employ, and themes, the songs also further tighten the thematic connection the headliner makes with the standout guests. In many ways, Chicken Skin Music is the equivalent of Buena Vista Social Club more than 20 years before the latter emerged. Experience it the way Cooder and company meant it to be heard – in unparalleled fidelity.